As 2014 comes to an end and we look ahead to 2015, we at the Ithaca Shakespeare Company would like to take a moment to thank you for being part of our family. 2014 was a year of major expansion for us in almost every possible way, all of which was only possible due to the support and enthusiasm of our fans and audiences. 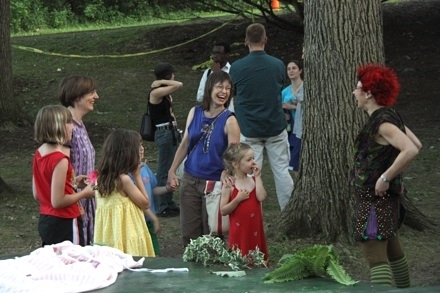 So, thank you for all you do in support of Shakespeare in Ithaca! 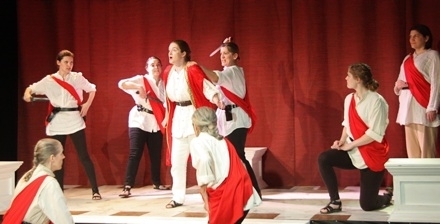 We performed our February 2014 production in the Hangar Theatre, allowing us to accommodate a much larger audience and use more sophisticated set, lighting, and sound techniques than was possible in our studio space. More importantly, we began a successful and mutually beneficial collaboration with the Hangar that will continue and grow in 2015 and beyond. 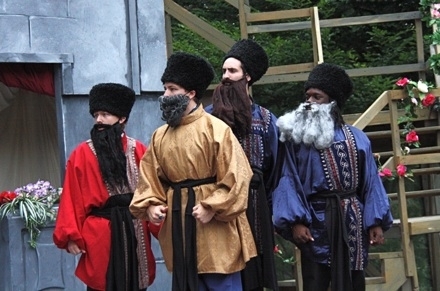 Once again, the growth in attendance required us to move our summer productions at Cornell Plantations to a new location, adjacent to our previous site but able to accommodate a much larger audience. The new location in a beautiful meadow surrounded by tall trees gives our summer festival a great deal of room to continue growing in the coming years. For the first time, we introduced a fourth fully staged production in the fall, our all-female production of Julius Caesar. 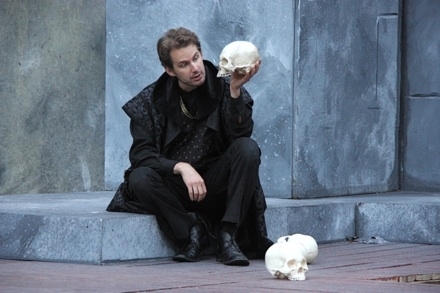 Though smaller in scale than the other shows in our season, this production allowed us to explore a new and exciting approach to Shakespeare's works while expanding the range of talented theatre artists able to work with us. ISC is now the largest classical theatre program in all of Central New York, drawing a total audience of well over 5,000 per year. And while we will always maintain our commitment to provide opportunities for local theatre artists, we had more personnel than ever before come from out of the area to work on our productions in 2014. Actors and designers came to Ithaca from New York City, Chicago, California, and elsewhere to work with us this year, because they wanted to be part of what we are doing here. Looking ahead to 2015, we expect this expansion to continue. We are beginning the largest and most complex project we have ever attempted, a series of five productions of Shakespeare's history plays. These are big, brilliant, exciting plays, too rarely performed, and we're tremendously excited about the possibilities for telling this epic story across multiple productions. 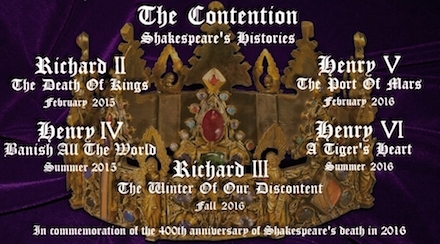 Beginning with Richard II in February 2015, the shows in this series will alternate between indoor shows at the Hangar Theatre and outdoor performances at Cornell Plantations in the summer, and the series will culminate in 2016 to commemorate the 400th anniversary of Shakespeare's death. Shakespeare festivals all over the world are marking this anniversary in a variety of ways, and we're thrilled to be part of that mass celebration. We'll also be introducing a new Shakespeare for Kids program in conjunction with our summer shows in 2015. Our summer productions have always attracted large numbers of children of all ages, and this program will allow us to take them deeper into the excitement of making Shakespeare come alive. This week-long exploration of Shakespearean performance techniques will immerse children in Shakespeare's works and give them the chance to prepare and perform scenes from Shakespeare on the stage for our summer productions. All this growth is exciting, but of course it also brings with it a whole new set of challenges. We are constantly working to improve our productions and offer more variety and higher quality in our programming and educational outreach. But each improvement and expansion increases the need for higher levels of funding and a greater administrative capacity to keep up with our expanded artistic and educational activities. As with most theatre companies, ticket sales alone cover less than 50% of our expenses; for the rest, we rely on gifts and grants from individuals, businesses, and government agencies. We know you have probably been besieged with year-end requests for donations from many worthy organizations, but as you think about the exciting growth that ISC has undergone this past year, we hope you will consider making a contribution to help ISC continue moving forward in 2015 and beyond. We believe a thriving, high-quality classical theatre program makes an important and valuable contribution to our community, and we need your help to continue building the best possible Shakespeare program in Ithaca. You can make a gift to support Shakespeare in Ithaca by clicking on the "Donate" button below and filling in the amount you wish to donate. If you prefer to donate by check, you can mail it to the address at the bottom of this letter. Gifts in any amount are welcome, and all contributions are tax-deductible. Thank you again for all your support, and best wishes for a Happy New Year from all of us at the Ithaca Shakespeare Company!